Teaching Ideas for AP* History is a new professional resource for teachers of AP United States, European, and World history. In three hours of interviews with 30 AP history experts, teachers, and college professors, this video offers a wealth of advice on varied topics, including creating a syllabus, reading and writing strategies and specific assignments to help students develop their historical thinking skills while learning historical content. The disc also includes dozens of files, from lesson plans to graphic organizers, that can be downloaded and used in class. Finally, a series of downloadable discussion questions for teachers that allow the DVD to be used effectively in a formal professional development setting. 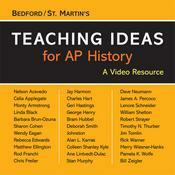 Teaching Ideas for AP History is truly a one of a kind resource that is only available from Bedford/St. Martin’s.